I can't resist a good cookie and Isabella's Cookies qualify as just that. As a matter of fact, they are better than good! They are perfectly soft, chewy, flavorful and void of preservatives and artificial ingredients. The ingredients they put in their cookies are fresh farm butter & eggs, Madagascar Bourbon Vanilla, extra creamy peanut butter chips and semi-sweet chocolate, to name a few. I must warn you, though, these cookies are dangerous! I was the recipient of the Hot Chocolate and Orange Cream Dream cookies and I found myself at the bottom of a bag before I knew what I was doing. So you do need a plan before you start eating them out of the bag. A good plan would be to share with someone else! That way, you won't find yourself having eaten them all in one sitting! Each cookie weighs .33 lb. - That's generous! The Hot Chocolate Cookie is amazing! It has chipotle in it, and I didn't know it when I tried them. I was naively thinking that they would taste like a cup of hot chocolate. Not so! It definitely tasted very chocolaty, chocolate chips and all, until a few seconds after I swallowed. It was then that I felt a definite "hot" sensation on my taste buds, but not too hot! Just enough to make you say, wow, that is some potent chocolate! And I really, really liked it! Trust me, I am a choco-holic, and know these things. Just look at my chocolate board on Pinterest! The Orange Cream Dream tastes just like a Creamsicle! They are so delicious! And what gets me is the freshness of the cookies. I could definitely fool people into thinking that I baked these and that I am a ultra-professional baker! "I fell in love with baking as a little girl and always thrived on the happiness brought to others by my cookies. 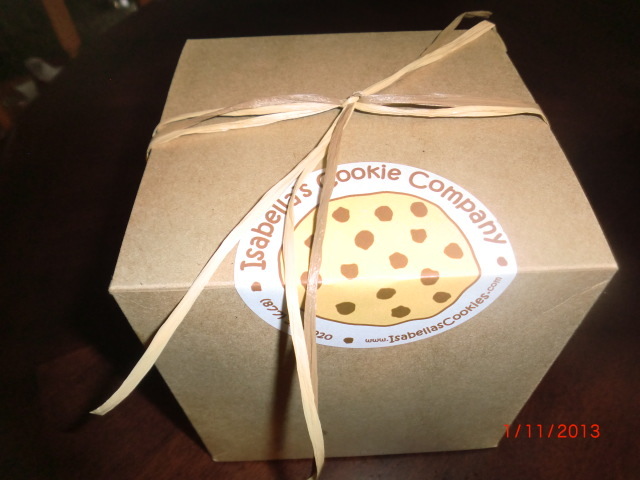 In 2001, I founded Isabella's Cookie Company with that same spirit and a mission to satisfy the world with my fresh baked cookie creations". The woman behind the cookies, Jennifer Palmer. No her name isn't Isabella! A big event is coming up here in Utah on Jan 18 through the 24th--The Slamdance Festival. It is a showcase for independent filmmakers, producers, directors, etc. As an official sponsor at Utah's Slamdance Festival, Isabella's will be much appreciated by all of the attendees there! As a token of appreciation to all who love independent films, Isabella's is having a Slamdance Gift Box Special. It includes 2 bags of cookies--the Peanut Butter Bombs and the Rocky Road Bites in a gift box! It is $3.50 off the normal price. Some other info: All Isabella's Cookies are certified Kosher Dairy and they also have 4 Vegan cookies as well! Isabella's does not currently have its own retail store, but is sold in fine food stores everywhere. Check your local 'Whole Foods' for a selection near you or check their store locator on the site. Isabella's is named after a close friend of Jennifer Palmer, the founder of the company. Two other cookies I'd like to highlight are the Rocky Road - a chocolate cookie with chocolate chunks, gooey marshmallows and almond slivers and the Paddy - a cookie loaded with chocolate chips and green mint chips! Disclaimer: Open to U.S. only. I received product for this giveaway for review purposes. Must be 18 years of age or older to participate. A GAL NEEDS...is not responsible for non-delivery of product or services by any featured companies. Winner will be contacted after 1/30/13 by e-mail. Must respond within 48 hours. Entrants with invalid entries will be disqualified. I'm dying to try the flavor Dark Mocha Monster. Paddy! I love chocolate and mint! I would say the Paddy! the vegan breakfast cookie! thanks! The Peanut Butter Bombs look amazing!! The Peanut Butter Bombs are my favorite. Orange Dream Cream sounds FAB! I would love the peanut butter bomb cookie and the rocky road cookie. Lil Sweet Bella would be perfect for my kids and I would love dark mocha monster. Other than the ones you reviewed, I like the cran-apple fritter. But I really like the concept behind the hot chocolate. Oooh Apple Fritter or maybe Hot Chocolate or Paddy or... Yeah they're making me drool ;) Thanks for the giveaway! Oh I would love to taste the Hot Chocolate! CHOCOLATE HAZEEEEE~~ I love dark chocolate and hazelnuts! Would love to try the rocky road! The Scottie sounds so good! These cookies look so delicious!!! !